Did the Indians of South America use bulldozers to build their great cities? 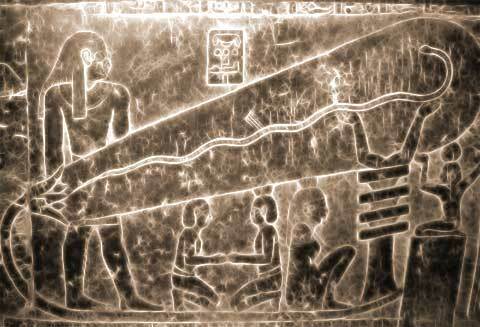 Did the ancient Egyptians invent television? Or are we in danger of seeing the past through modern eyes? The belief that a superb technological prowess was possessed by past civilisations, a prowess that is totally unacknowledged in the standard history books, is nourished by the oddities and anomalies that crop up here and there in galleries and museums. Often they have been shown for years as quite ordinary objects; and it takes a giant leap of the imagination to see them as anything else. One of the ancient artefacts that has been reinterpreted by recent authors is a small figurine that was classified as a model jaguar when it was found in Panama in the 1920s. But it takes on a new appearance in the light of the suggestion that it was actually an earth-moving machine, like a present-day bulldozer. Despite the model's antiquity, the curious triangular appendages begin to look like shovels carried on mechanical arms. The cogged wheels that are mounted on the model's tail look as if they should engage with chains or belts. On the other hand, sceptics point out, the construction of a full- sized earth-mover would demand considerable technological resources - facilities for smelting iron, for example, and manufacturing large machine parts - of a kind for which absolutely no evidence has been found. An Ancient Earth Moving Machine? The authors who discuss this curiosity are not slow to connect it with such prodigious feats of city-building as that represented by the 'lost' city of Maehu Picchu, built 6850 feet (2100 metres) above sea level in the Peruvian Andes. They claim that machinery would have been needed to move the vast amounts of earth and stone required by the construction. But even this claim has little substance: it is quite possible that these huge feats demanded no more than muscle-power. Were the Egyptians the First with the Concept for Television? One of the serpents lies straight along the length of the tube. The head of the other erpent is bent to one side - away from the figure of a baboon holding a knife. Noorbergen claims that this shows an electron beam being deflected by an electrically charged object - the knife. A demonstration of the properties of electrons is being portrayed. When the Diqui's Delta was being cleared for plantations in the 1930s, the workers found their task hindered by hundreds of stones that appeared to have been artificially smoothed, scattered over the forest floor.The largest were about 8 feet (2.5 metres) in diameter, and were nearly perfect spheres. The stones were probably roughly shaped as they were hewn from natural blocks and then polished with smaller stones, with wet sand as an abrasive medium. Their shape must have been frequently checked with accurate cut-out templates. The whole process must have required the patient labour of huge numbers of people over a long period. place where they were quarried, possibly at the mouth of the Diquis River, to their final resting places, perhaps 30 miles (48 kilometres distant. They were often placed in groups, or in straight or curved lines. Some are to be found over human graves. But the purpose of this enormous effort is quite unknown. Some people speculate that the stones represent the Sun and Moon (and it has been suggested that they represent other heavenly bodies as well); others think they are intended as a physical embodiment of perfection. The two ideas may not be distinct if the makers of the stones viewed the heavenly bodies as perfect, as some ancient Greek philosophers did. There is no technique for determining the date at which the stones were shaped. Remains associated with some particular ball occasionally give clues, but on the whole these conflict. So we do not know who the makers of the strange spheres were, nor what the aim of their activity was. Infinitely patient grinding was also required to sculpt the superb features of the lifesize quartz skull found in British Honduras in 1927 by the British explorer F. A. Mitchell-Hedges. 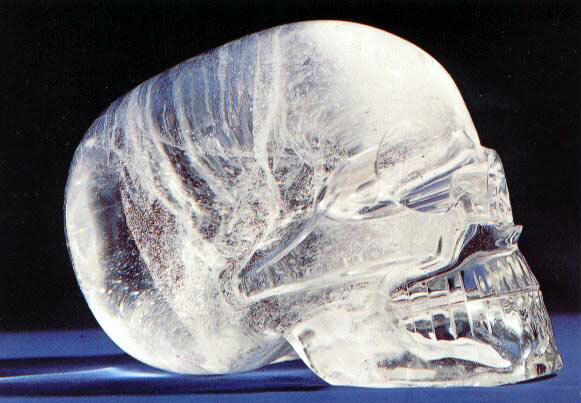 He describes it:”The Skull of Doom is made of pure rock crystal and according to scientists must have taken 150 years, generation after generation working all the days of their lives, rubbing down with sand an immense block of rock crystal until the perfect skull emerged. ... It is said that when he [the high priest of the Maya] willed death with the help of the skull, death invariably followed. It has been described as the embodiment of all evil”. Many of these assertions are perhaps the invention of Mitchell-Hedges himself. It has even been conjectured that he may have had the Skull of Doom made as a birthday present for his daughter. It was she who found it beneath the altar in the Mayan city of Lubaantum during excavations by Mitchell-Hedges, on her 17th birthday. naturalistic. To have ground such lovingly modelled objects from quartz, an extremely hard substance, would indeed have been a labour of devotion - unless the Maya had techniques available to them that we are not aware they possessed. Indeed, it is often suggested that ancient stonemasons must have had more effective cutting instruments available to them than the relics that have been found suggest, and perhaps even stone-softening liquids, in order to shape the intricately interlocking stones of such cities as Sacsahuaman in Peru. So perhaps sculptors working on a smaller scale were not, after all, condemned to the years of polishing of which Mitchell-Hedges wrote. have acted as centrepieces in some awe-inspiring temple ritual. But such explanations merely cloak our ignorance of themotivation of the ancient craftsmen. you just made me want to go back to Egypt. Great article, fascinating! I love topics like this. Nicely researched, well done on the feature! Thank you very much for the comment and reading the article. Hi there. Thank you for the comment. Always nice to have the feedback. Nice article. I did an article on the Crystal Quartz Skull. Thank you for reading and the comment. Look forward to reading your article too. As a history buff I loved this article. And, I am always intrigued by the "puzzles" that arrive with so much of the ancient world. (Have you ever read the Lost Book of Enki?) Anyway, more than a thumb from me--5 big stars for this one! Hey Marlando. Thank you for your comment. I do enjoy the history work too. Only something I have got into recently, but very rewarding. Thanks for reading. Thank you for reading the article and leaving a comment. Much appreciated. Hey there. Thanks for the thumbs up. Im very much the same; enjoy reading the history articles and learning something new.